Animals rescued from abuse have many different means of coping. Some are able to forget their pain almost instantly, while others must travel a longer road to recovery. 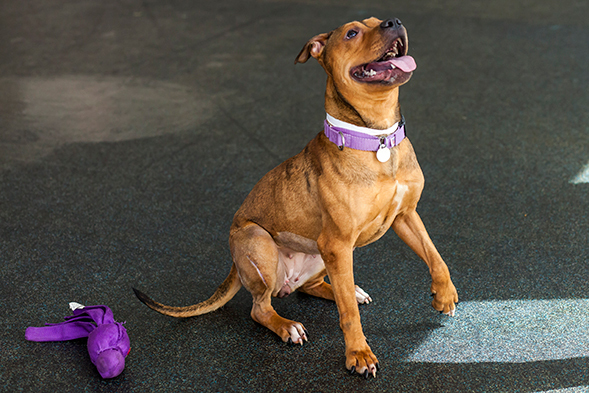 For Bailey the pit bull, every tail wag, kiss and nuzzle is a major milestone that serves as a reminder of all that she has overcome. Fortunately, a loving adopter has been by her side almost every step of the way. Here is Bailey’s Happy Tail. 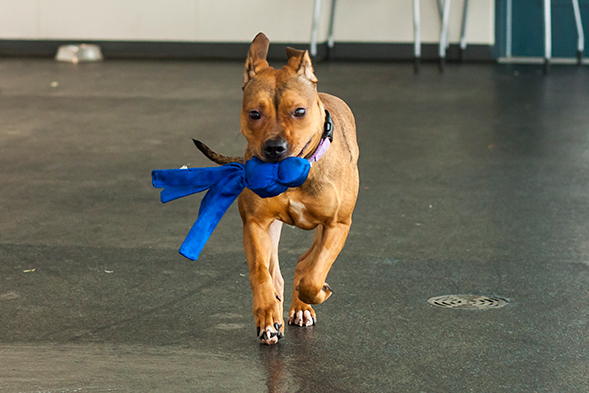 Bailey came to the ASPCA in May 2014, almost one year ago to the day. She and seven other dogs were rescued from an abusive situation that involved hoarding, street fighting and confinement in a squalid basement. Shaking from fear and terrified of strangers, Bailey was clearly traumatized. She spent the next three months at the ASPCA Animal Hospital, where she was spayed and received surgery to repair an injury on her right hind leg. 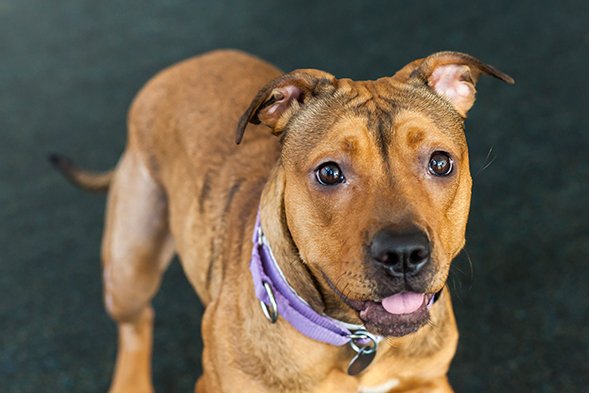 At the end of August, we moved Bailey to the ASPCA Adoption Center in hopes of finding her forever home. She was still scared, but we believed that the right adopter could help ease this sweet dog’s emotional wounds—and fortunately, we were right. On November 13, she met Freddy C.
Aware of Bailey’s issues and anxiety, Freddy readied himself for the road ahead. “When I first brought her home, she didn’t want to leave the house and seemed terrified whenever she was outside. She would pull back toward the building the entire time we were out. She also had no bark; she would nervously, quietly sit or lay down,” he says. But Freddy was patient, and with stability came progress. We believe that Bailey’s journey is just beginning, and we are so grateful to Freddy for giving her a second chance at life. “I’m very happy I adopted her,” he says—and we know she feels the same way, too.